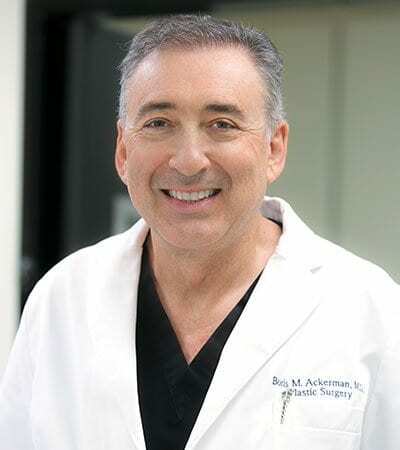 Injectables Newport Beach | Boris M. Ackerman, M.D. The natural course of aging, sun damage, heredity, and the repetition of facial muscle movements all leave their distinct marks on our faces in the way of wrinkles, fine lines, and thinning features. Even the most regimented skin care practice cannot entirely prevent any of these natural blemishes from occurring. As we age and are faced with the elements, our skin loses collagen and elastin, and the supple quality of our skin diminishes. While there may be no way to prevent this from happening, there is a way to lessen these negative effects on our skin. The following injectable procedures can help restore a youthful quality and appearance to your face so that you will not only be looking rejuvenated, but your confidence and self-esteem will be boosted as well. Your initial consultation is a vital part of your treatment plan. During your consultation with Dr. Ackerman or a member of our expert team, we will discuss what you can expect from your injectable treatment as well as your aesthetic goals. Since no two faces are alike, your treatment shouldn’t be cookie-cutter, and we will develop a plan to meet all of your goals. We will discuss your facial concerns as well as determine which treatments will best suit your desires. The professionals in our MedSpa use a variety of filler products. Our expert injectors determine the ideal filler product to achieve the best rejuvenating effect for each patient. JUVÉDERM® XC is an injectable dermal filler derived from hyaluronic acid. This acid is a naturally occurring substance in the body that allows your skin to retain moisture and fullness. JUVÉDERM® XC can be used to treat moderate to severe wrinkles, lines, and folds around the mouth and nose and can restore age-related volume loss. JUVÉDERM VOLUMA® XC is an injectable dermal filler that instantly returns the volume to hollowed cheeks. JUVÉDERM VOLBELLA® XC is specifically designed to enhance lip fullness in patients over 21 years of age. JUVÉDERM VOLLURE™ XC corrects the appearance of moderate to severe facial wrinkles and folds. Restylane® restores lost facial volume, smooths wrinkles and fine lines on the forehead as well as between the eyebrows, and creates fuller, more luscious lips. This filler is made of hyaluronic acid and has been safely used to treat aging faces for decades. The results of this treatment are instant and tend to last between six months and one year. The gold standard for non-invasive treatments, BOTOX® Cosmetic is FDA approved to treat wrinkles and fine lines on the forehead, furrows between the eyebrows, and crow’s feet. BOTOX® Cosmetic works by temporarily relaxing the muscles in the face, allowing for a smoother, more rejuvenated appearance. Treatment sessions take under 15 minutes to complete, and the results last anywhere between three and six months. BOTOX® is also FDA approved to treat chronic migraines, excessive underarm sweating, and overactive bladders. Our aesthetic nurse specialists provide expert microneedling therapy with various serums to achieve healthy and glowing skin. Microneedling treatments create tiny “wounds” on the skin that stimulate collagen production and the growth of new, healthy skin cells, thus improving a variety of skin concerns. Since injectables are non-surgical and non-invasive, there is no downtime needed after treatment. You can return to work and your daily routine immediately following the injections. You may experience some tenderness, redness, and swelling that may persist for a few days. Discomfort can be remedied with over-the-counter pain medication.